It's Super Bowl 43!! Who are you cheering on? The Arizona Cardinals or the Pittsburgh Steelers? Do you have big party plans or do you become a Super Bowl widow? We've been busy adding tons of product into our newly added shopping cart and we want to celebrate by giving you 25% off!! Includes sale items! Order over $50.00 and get FREE shipping! Because we want everyone to win, our "Get a Quarterback Sale!" will not end until February 8th, giving you an entire week of savings!! Hurry limited to stock on hand! February 1st until February 8th! As a loyal blog reader you know first about our Sale! Go ahead and take a peek, we'll be adding product all night and possibly all week!! Remember sale pricing will not show until February 1st! I'm going to be drawing a lucky winner on Sunday!! How do you enter you ask? You'll have to look at past blog post to find out how!! I'll give you a hint, it's a post since January 1st of 2009. Find the post and get entered to win by midnight January 31st! Rene Zellweger stars with Harry Connick Jr. in an upcoming romantic comedy movie directed by Jonas Elmer. I haven't seen the movie but do hear that the best friend in the movie is an avid scrapbooker. I'm anxious to see how our favorite hobby is portrayed in the movie. Let me know what you think of the movie if you get a chance to go. We are still trying to go see Hotel Dogs!! I'll be on the search for great new products to share with you ladies. I can't WAIT!!! I'm so excited, I've already got a list of must see booths to hit and love finding those hidden treasures too. On the top of my list will be Fancy Pants, We R Memories, My Mind's Eye, Rusty Pickle, MOSD, Bo Bunny, Prima, Basic Grey, Queen and Co....just to name a few!! I'll try to get some pictures posted while I'm gone if I can figure out my Internet on my phone!! Cross your fingers for me! I will be adding new class kits and the January Birthday Kit next week so stay tuned!!! Project 365 pictures for this week will be added upon returning next week. Behave while I'm gone and have fun. I'll be returning Tuesday night late, hopefully the weather will behave so I can get back. Isn't this the coolest? I would do one of Tyler but he'd kill me!! You can get 6 custom Valentine Cards FREE by going to Scrapbooks Etc - Stories by Everyone. They have several designs to choose from and it's pretty easy to do. You do have to create an account first. After finishing click the Shop button and select Create your card now. Select the design you like and click the Build Now button. Follow the steps given to create your custom cards. When you have completed your valentine card enter the code Valentine at checkout. You'll want to enter the code in the coupon box, then hit recalculate. It should update your total to $0. Continue with checkout information. These are FREE including shipping. Make sure you pull down the shipping tab and select FREE shipping, wait until screen refreshes and shows a $0 before going to next page. You do NOT need to enter credit card information. It will process with no payment info required. Cool huh? Offer expires February 1st, 2009. They have some really cool gift ideas be sure to check them out!! **FYI, I couldn't get the plug in required to download using Foxfire so had to switch to Internet Explorer. 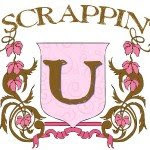 Don't forget we have registration open for Scrappin' U! You can get all the details on the K.I.S.S. website. We would love to have you spend the day with us! Think of it as your Valentine's Day gift to yourself. You deserve it!! Yep, ME!! Anyone that knows me knows that this is so not like me. I'm not a big video game person, I'm honestly not much for exercise yet I'm addicted! I've "worked" out for three days in a row and I'm loving it. It's just amazing how playing a game can be a real workout. My muscles are screaming at me right now and of course the guys are saying it won't last but I just might. Who knows, maybe I'll actually loose a few pounds! Also wanted to share one of the new Class Kits that I'll be posting soon under the Class Kits section of the KISS site. Remember, blog followers get first peeks! I just love all the bright colors and playfulness this kit has! Watch for this and others on the KISS site soon!! That was incredibly fast and it's pretty cute. It couldn't have come on a better day. Emma had three teeth pulled today and on the way home we stopped at the mailbox and there was her surprise calendar. She was very happy but couldn't smile much. I didn't tell her about the calendar, chose some of her favorite people including her doll and made her very own 2009 calendar. She's already adding dates to it! LOL!! I hope that some of you took advantage of the coupon code I posted a few days ago and got your free calendar. And yes, that's my Emma with three less teeth. She goes back next Thursday for three more to be pulled. YUCK!! First I want to say thanks to all who've emailed with comments on my project!! I'd love to see yours so leave me a link if you are posting your Project 365. The dreaded rush of Monday mornings! Any school day for that matter. I'm not a morning person!! I try, I'm just not wired to be a morning person! It's not in me! So our school day starts by Greg waking me up at 6:45. I get the kids up, fix breakfast if Greg didn't before he left and we are out the door by 7:30 preferably but usually more like 7:40. I take the kids every day to keep from having to keep up an hour earlier. Terrible I know but it's what we do! Coffee! YUCK!!! I don't like the smell or taste of it. Who does in my house? My son! He has his own coffee pot and makes coffee just about every morning. Who would teach him to do this? His Nanny. She's no longer with us but every time I see him drinking coffee it reminds of the days when I'd go to pick him up from Nanny's and they'd be sitting at the kitchen table sipping on coffee, chatting and playing cards. The old saying "it will stunt your growth" either hasn't worked on Tyler or it's working and keeping him from being 8' tall!! Where's the stinking toilet paper? This has got to be one of my biggest pet peeves? Why oh why can't you replace the roll if you use the last of it? No one in the house does so you sit, you scream and you wait!! URGH!!!! Happy Birthday to Greg!! The kids made him a strawberry cake right after school, we fixed lasagna and had a quiet dinner at home. Emma had to dress up of course since it was a party! Daddy seemed to enjoy that! It's so weird to think that Greg is 38 now! He's so handsome! I love all the white hairs that are popping up on his beard and chest. None on his head, it's getting pretty slick. LOL!! 20 years since I first met him and he's still got that twinkle in his eyes and that yummy smile that made my heart flutter way back then! My phone! We have a love/hate relationship. Most days I love it..it keeps my in touch with my kids, my mom, my customers, my friends. I get wonderful texts daily and sometimes several times a day from my hubby. Just simple things... "I love you", "thanks for dinner last night", "are you having a good day". Just quick simple notes that make me feel so good BUT there are those days that my phone won't leave me alone. It's beeping, it's ringing, the kids are screaming, mom's talking, tv's going and it's just too much!!! I love it/ I hate it but I can't see living without it! All babies are miracles I know that! But when you have a little guy that was so sick when he was born to this little guy now! WOW! It's just amazing. Getting to hold him, looking at those gorgeous eyes and being captivated by his smile and cooing, it just can't be beat! Cole is the son of a customer, Terese. 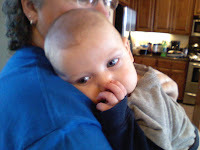 Cole was born with intestinal issues and has had to go through surgeries and is facing more. He's got the sweetest spirit about him, so laid back and he loves his thumb! (too cute!!) We've been praying for this little guy for some time and am so thankful that he's doing better. I tell ya, all I could think while I was holding him was that I was holding a MIRACLE! I'll have to update this next week. Don't have my pictures for it yet! Thanks for sharing your week with me! Hope you've done some scrapping! Like scrapbook idea books? Here's a special valid only until midnight, January 19th at MyCraftivityShop.com. They have a ton of older idea books on sale for $5.00 each and with a free shipping offer on orders over $30.00! They are older books but there are some good ones on sale, you just have to look for them mixed in with the other craft books. Enter coupon code MMFS0117 for your free shipping. I just played around and ordered a 16 x 20 calendar on Shutterfly. I was able to upload pictures very quickly and easily and now I've got a fun, personalized calendar on it's way to me. The best part...well there are actually two. 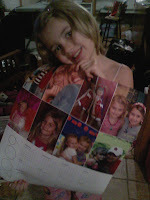 First, I made it for Emma with pictures of her favorite people as a surprise. She's always writing things like when a new movie comes out, a new tv show is on, birthdays of friends, etc on my work calendar so this will be perfect for her. Second, I only paid $5.36 for it!! The calendar is $19.99 plus shipping and taxes BUT when you put in the code FREECALENDAR you only pay shipping and taxes!! Go ahead, try it out and let me know what you think!! http://www.shutterfly.com I LOVE IT!! No not really but you all may very well be the first to see the new product tab on our home page, http://www.kisscropnshop.com. Under the products tab you will find our new Kit of the Month as well as our Class Kit of the Month. We'll be adding more class kits as they are finished so keep checking back. Our Birthday Kit will be revealed on February 1st! I think you're gonna like it! Oh and I've got Scrappin' U registration open on the home page http://www.kisscropnshop.com. I can't wait to start scrapping with all of you again!! Check out the details and hope to see you there!! Wow! This week just flew by!! Here are my photos for week two of Project 365. Thanks for looking! Yep! Spent another day at the doctors office. Today was Tyler's turn, all is well just a minor thing. We also had a dentist appointment for Emma. She was referred to an orthodontist due to some overcrowding of her teeth. UGH!! The kids went back to school from Christmas break and I started back to work (finally!) I really thought I was ready for them to get back to school but have to admit I really missed them being here! Isn't that crazy?? They drive you crazy and you can't get anything done yet when they are gone it seems so strange and I'm always wondering what they are doing. If I could get my blasted picture of my camera phone I'd post it here! Anyone know how to do that??? Tyler went to his Green Hand Convention for Ag. I was planning to take a picture of his green hand when he got home but found out they no longer do that. Too bad, it's so funny to see!! I did get a great picture of his jacket but guess I'll have to figure out how to get it off my phone first!! Oh and Emma- she went to the orthodontist today. She has to have 6, yes 6 teeth pulled on the 20th to make room in that little mouth of hers!! I swear I'm buying insurance on that kids mouth! She's got over $2000 worth of dental work already and we are facing possible braces at 9 or 10! YIKES!! The bad thing... her teeth don't look bad, it's all the unseen problems we are dealing with. These are the hands that help me keep this business going! I really don't know what I'd do without them!! No! They aren't mine, they are my mom's. She does all the grunt work in this business. I get to design while she's counting, packing and in this picture sorting and doing inventory. This last week she spent a couple of days trying to get all our paper organized. I'm so glad I have her! While she's doing this, I can work on my website, blog, message boards or design class kits! Thanks Mom!! I LOVE seeing this vision when in the car!! It's not just a picture of my husband but it means that he's in the driver's seat of my car. Too most that's not a big deal but having dealt with two back surgeries and on going issues, when Greg's behind the wheel it means he's having a good day! Today he felt good enough to go to the High School basketball game. Wow!! What a game, we lost but it was one of those great games and the boys played pretty good. Hoping to see more games this season. UGH!! Where the heck did this come from? I have a nasty, nasty head cold! I swear I can't breathe with my nose and my throat hurts so bad from breathing with my mouth open. This is all I seen today besides a hot wash rag over my face and a pillow all day! NOT FUN!! 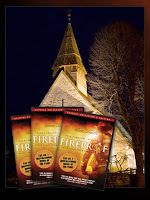 Our church did a free showing of the movie Fireproof. My friend Debbie and her hubby Glen went with me. Greg was suppose to but he was hurting too bad to sit up. I was pretty disappointed that he couldn't go!! DANG back!! It was a good movie, some not-so-great acting but the message is great. I'm so thankful I have Greg and the marriage we have is good! We have been very blessed!! Sign up to be a K.I.S.S. Events friend by clicking on the link to the left, Follow this Blog. You can even add your picture if you'd like! What a great way to put a face with a name before our crops! Join today!! Everyone that joins before January 31st will be in a drawing for a special prize package. One package will be given to a random winner on February 1st! Have a great weekend! We are going to go watch the high school basketball game tonight! YEAH!! I miss the basketball games, sure wish Tyler would have played. Oh well, maybe next year! Check out these photo printing sites? Sign up and get 40 or 50 free prints from each site! Clark Color Labs: 40 free prints when you sign up for a new account, with yoru first order. Only $.08 per print after that! I haven't had time to upload any of my photos but you can bet I will give them a try!! I need to find someone to give Piano lessons to my six year old and probably her best friend Ryli. I would prefer the Granby, Diamond, Neosho or Carthage area if possible. Any suggestions of who to call? She got the keyboard she wanted and really wants to learn how to play it. I want to get her lessons before she picks up bad habits. Emma got Ella for Christmas, she thinks it's an American Girl Doll but it's the knock off version from Target. It's suppose to look like her and it actually does. We're gonna see how long the relationship last before we get her the real deal. She takes Ella everywhere and is really wanting some outfits for it! I would be willing to do some swapping if anyone is interested. Here are my first week photos. We're having fun doing this so far!! 12/31/08 - Emma and I had a great day just being lazy and playing! We stayed in our pajamas all day, played with Play Dough in my skillets, read LOTS of books and enjoyed a quiet day with no boys! LOL! I am so thankful I finally have another reader in the family! Emma read over 20 books today! 1/1/09 - We made it!! Well, Emma and I did! The boys were both asleep before midnight but Emma and I made it into the New Year! We spent the evening at home playing Wii tournaments. It was alot of fun and I know it's probably the last time we'll talk Tyler into staying home with the family. He's getting at the age where that's just not cool!! Three pictures today! My parents were given a horse by a friend of mine recently. They've been keeping it a secret from Emma and Talon for a few weeks. Today, mom calls wanting to take Emma to meet her new horse. Of course when I tell Emma to get ready she's got a surprise she starts begging to know what it is. The first picture is of her calling my dad to find out what her surprise is. The second is of dad and Emma meeting the newest family member! Emma was very shy and reserved about the horse. Talon cried when they told her! 1/2/09- YUCK! Bill paying day!! Property taxes, electric bill, doctor bills! UGH!! Also had to take Emma to the doctor today, she had a urinary trac infection. Nothing more fun than spending a ton of money on bills then sitting in the doctors office for over 2 hours to tell you what you already know and get a prescription! NOT!! 1/3/09 -I scrapped for ME!! Yep, I really did! Went to Debbie's and actually scrapped the first dance pictures of Emma ever! She's danced for 5 years now and this is the first time I've scrapbooked any of her dance pictures. I LOVE the papers and how all the pages turned out. Well, almost...I'm not sure on the large picture of her, it needs something but other than that I'm tickled pink that I completed 10 pages for my personal albums!! YEAH ME! Anyone up for a challenge? I don't know about you but I always seem more motivated to complete a task if I'm up on a deadline or I have a challenge and someone to hold me to it. So, I thought it would be great to challenge each other this year with things to help us get organized, promote good health, create and share. Anyone up for this? It's easy, simply take the challenge and post your challenge results here. If you'd like to share a photo of your challenge completed simply email it to me at info@kisscropnshop.com and I'll post it for everyone to see if you'd like! We all have too much stuff! It's said that clutter bogs down your creativity so let yourself be free! For our first challenge, it's simple. Instead of sorting and storing items that you're never going to use take 10 minutes and purge 25 items! That's it! 25 items! Old magazines, papers that aren't your style anymore, embellishments that no longer scream "you need me! ", etc. Toss them in a recycle bin or better yet, put them in a box labeled "Drop-n-Swap" and bring them to the next KISS Event to be traded or given to fellow scrappers. All these items were just taking up space, collecting dust and not being used so they are in a bin marked for the KISS Drop-n-Swap. Come on, join me!! Set the timer for 10 minutes, purge, take a photo and post here!! You and your space will be happy you did! !